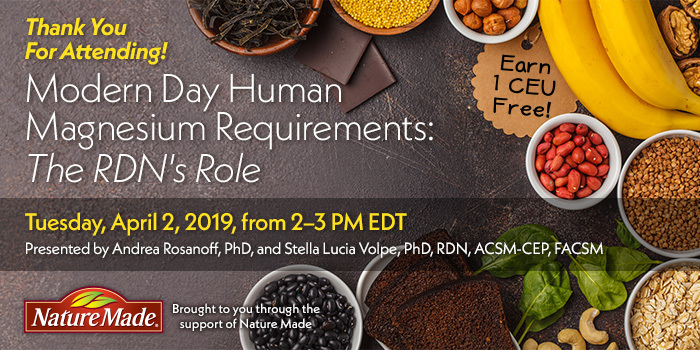 Thank you for attending our webinar "Modern Day Human Magnesium Requirements: The RDN's Role", presented by Andrea Rosanoff, PhD, and Stella Lucia Volpe, PhD, RDN, ACSM-CEP, FACSM, on Tuesday, April 2, 2019, from 2–3 PM EDT. You must complete a brief evaluation within one year of the live program (before April 1, 2020) to claim your CE credit and download your certificate. 1. Go to CE.TodaysDietitian.com/Magnesium OR log in to CE.TodaysDietitian.com, go to "My Courses" and click on the webinar title. We will be posting a free recorded version of the webinar as soon as possible on CE.TodaysDietitian.com to make all the great information presented and the continuing education credit available to all professionals. This complimentary 1 CEU webinar is brought to you with support from Nature Made®.